Once again, I am taking up the challenge issued by the Preacher’s Institute to blog every day during the Nativity fast. Last year, I focused on St. Leo the Great and some of the gems that he has throughout the several homilies that we have of his on the Nativity. It was very useful to have such a concentrated focus. Thus, I will be doing something very similar this year — I will direct my attention toward St. Gregory Palamas. Although I am only aware of one homily on the Nativity that has come down to us from St. Gregory, it is a very rich mine from which I think I can glean many a blog post. I also have a very personal reason to spend this amount of time with St. Gregory. 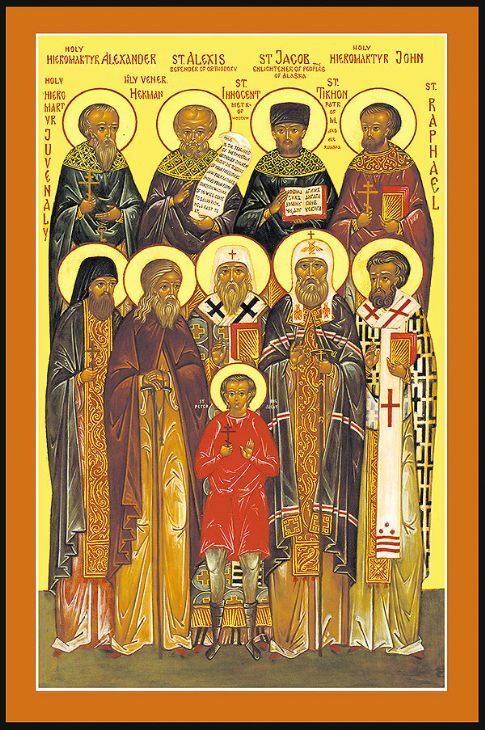 As someone who came to the Orthodox faith later in life, one of the most difficult things to get my head around (and one of the things I desired most as an outsider) was the relationship we have with the saints. I grew up loving mythology of all stripes. I read stories from every continent. Thus, when it came to the lives of the saints, I came at them from a mythological perspective — I tried to understand them as metaphor. While this works to a certain extent, it fails to appreciate the reality of the saints. These are real people who lived real lives who are now more alive than you or I could possibly imagine — in Christ. Thus, the saints are people we can get to know. They are people that we can have relationships with — by getting to know them through their hagiographies, their writing, the hymnody and by praying for their intercessions. They, in turn, will let us know that they are here among us, praying for us and watching out for us. In the past year, St. Gregory Palamas has done just that for me. In the last couple of years, both my sister and my wife have lost a child inside the womb. Abigail was a victim of Trisomy-3 and Gabriel somehow managed to get his umbilical chord knotted around his neck. So it was with great joy that I received the news last autumn that my sister was pregnant again — this time with a healthy, vibrant baby; however, for a variety of reasons, she had to give birth via a cesarean section. My sister was scheduled to go into the hospital for pre-surgery prep on a Sunday. Her baby was born the next day. She and her husband named their little boy Gregory. This is where St. Gregory comes in. Are you man? Are you woman? Are White? African-American? Latino? Asian? Greek? Are you an immigrant? Are you native-born? Are you rich? Are you poor? Come, the Lord has set his table and everything is ready now. (1) He has sent his minion to fetch the poor. He has directed his servant to bring the blind. He has commissioned his slave to deliver the lame. (2) So that the Lord’s House may be filled, he has sent his Son to all those who travel the roads, the lanes and the highways to call them to sit at the meal. (3) He has planted His mustard seed which has grown into a giant tree, with branches filled with birds and their nests. (4) He has levened the loaf(5) so that it might feed those who come the from the east, from the west, from the north, from the south(6) to sit at his banquet and receive his love and mercy. God is with us! and Hades trembles. God is with us! and Corruption cowers. God is with us! and Decay despairs. God is with us! and Death is afraid. Christ is Born! The Last Adam has come! Christ is Born! Our nature is renewed! Christ is Born! demons are fallen! Christ is Born! angels rejoice! Christ is Born! Let all of creation exalt! Christ is Born! Life reigns! For Christ has taken on flesh to proclaim the Resurrection to the living and the dead. Let no ear fail to hear the Good News, for Christ has come. To Him be glory and dominion unto the ages of ages. We prefer to stay here, even crucified sometimes. Because in the gospel, it is written that it is given to us not only to believe in Christ, but also to suffer for Christ,” the patriarch said. “You said even to be crucified sometimes?” Simon asked. “Yes. Because we believe in the resurrection. After the crucifixion, resurrection comes,” the patriarch explained. It pleased Him to take away the sin of the world in the Nativity and Passion of Jesus Christ. All the pleasures of the world, and all the kingdoms of this earth, shall profit me nothing. It is better for me to die in behalf of Jesus Christ, than to reign over all the ends of the earth. “For what shall a man be profited, if he gain the whole world, but lose his own soul?” Him I seek, who died for us: Him I desire, who rose again for our sake. This is the gain which is laid up for me. Pardon me, brethren: do not hinder me from living, do not wish to keep me in a state of death; and while I desire to belong to God, do not ye give me over to the world. Suffer me to obtain pure light: when I have gone thither, I shall indeed be a man of God. Permit me to be an imitator of the passion of my God. We do not seek to suffer, but through Christ Crucified, we have the means to not only to overcome it, but to transform it by identifying our suffering with the suffering of Christ on the Cross. When we pass through this suffering — and because of this suffering — we will find resurrection. Amen. Where true peace is, there can be no lack of virtue. But what is it, dearly beloved, to have peace towards God, except to wish what He bids, and not to wish what He forbids? This needs to be understood from the perspective of Ephesians 2:14, “Christ is our peace.” If our lives are truly in Christ, our lives will be filled with virtue and we will be doing God’s will. Christ “has broken down the dividing wall of hostility” (Eph 2:14) that exists between God and His creation because of our sin. True peace is only found in Christ with communion of the Holy Spirit doing the Father’s will. We are not speaking of something we create by way of a treaty, we are speaking of a person — Christ. St. Leo gives us a practical way of determining how our lives are in relationship with Christ: virtue is a natural outcome of peace because Christ is the source of all virtue and Christ is our peace. When we steer our lives away from Him, we will find nothing but wickedness. Sans Christ — our peace and the source of virtue — there can be neither virtue or peace. Awake, O man, and recognize the dignity of thy nature. Recollect thou wast made in the image of God, which although it was corrupted in Adam, was yet re-fashioned in Christ. The first essential act in becoming like God is becoming aware of the image and likeness within. It is then that we, despite the radical inequalities of the fallen world, realize the radical equality we all have in Christ. No matter what background, no what disabilities, no matter what education, no matter what nationality, no matter what age — we are all made in the image and likeness of God and one in Christ. When we embrace this reality, miracles happen. Today we celebrate two saints that embody this reality — St. Spyridon the Wonderworker and St. Peter the Aleut. St. Spyridon was a simple shepherd. He married, he had a family and he tended his sheep. When his wife died, he was called to serve as a bishop. This simple shepherd then went on to defend the Orthodox faith against the Arians at the First Ecumenical Council. His simple explanation of our faith helped defeat the complex and academic explanations of the Arians. St. Peter was an Aleut seal and otter hunter from the island of Kodiak in Alaska. He became a Christian through the missionary work of St. Herman of Alaska. When captured by the Spanish in California, he refused to denounce his faith despite getting his hands and feet cut off one joint at a time. Recognizing the image and likeness of God within himself, he had the ability to move through the suffering and unite himself to Christ on the Cross. Through the prayers of Sts. Spyridon and Peter may we all awake and recognize the dignity of our nature and acquire a peaceful spirit. Amen. Note that His bed is a tomb and that His swaddling clothes are burial wrappings. St. Leo reminds us that the Nativity is intimately linked to the crucifixion. In many ways, we have forgotten the divine irony of the Cross. It was an instrument of extreme torture so heinous and humiliating that the Romans reserved it for the lowest of the low — outsiders and criminals. It was beyond the imagination of the Romans to subject a Roman citizen to crucifixion — it was just too horrible. Yet, we see the Cross as life-giving. My God, my God, why have you forsaken me? The words of my groaning do nothing to save me. My God, I call by day but you do not answer, at night, but I find no respite. Yet you, the Holy One, who make your home in the praises of Israel, in you our ancestors put their trust, they trusted and you set them free. To you they called for help and were delivered; in you they trusted and were not put to shame. But I am a worm, less than human, scorn of mankind, contempt of the people; all who see me jeer at me, they sneer and wag their heads, ‘He trusted himself to the Lord, let the Lord set him free! Let him deliver him, as he took such delight in him.’ It was you who drew me from the womb and soothed me on my mother’s breast. On you was I cast from my birth, from the womb I have belonged to you. Do not hold aloof, for trouble is upon me, and no one to help me! Many bulls are encircling me, wild bulls of Bashan closing in on me. Lions ravening and roaring open their jaws at me. My strength is trickling away, my bones are all disjointed, my heart has turned to wax, melting inside me. My mouth is dry as earthenware, my tongue sticks to my jaw. You lay me down in the dust of death. A pack of dogs surrounds me, a gang of villains closing in on me as if to hack off my hands and my feet. I can count every one of my bones, while they look on and gloat; they divide my garments among them and cast lots for my clothing. the Lord, do not hold aloof! My strength, come quickly to my help, rescue my soul from the sword, the one life I have from the grasp of the dog! Save me from the lion’s mouth, my poor life from the wild bulls’ horns! I shall proclaim your name to my brothers, praise you in full assembly: ‘You who fear the Lord, praise him! All the race of Jacob, honour him! Revere him, all the race of Israel!’ For he has not despised nor disregarded the poverty of the poor, has not turned away his face, but has listened to the cry for help. Of you is my praise in the thronged assembly, I will perform my vows before all who fear him. The poor will eat and be filled, those who seek the Lord will praise him, ‘May your heart live for ever.’ The whole wide world will remember and return to the Lord, all the families of nations bow down before him. For to the Lord, ruler of the nations, belongs kingly power! All who prosper on earth will bow before him, all who go down to the dust will do reverence before him. And those who are dead, their descendants will serve him, will proclaim his name to generations still to come; and these will tell of his saving justice to a people yet unborn: he has fulfilled it. Christ became a babe to accomplish this — to intimately connect Himself to the agony, suffering and death of one of the most heinous forms of execution ever devised by man. All this in order to turn it all on its head — to turn it right-side up — and make this instrument of excruciating torture and death into a font of everlasting life. This particular quote jumped out at me today, because of the phrase “falsely-called science,” which is part of a world view that is largely lost on the modern world. For St. Leo, there is a real necessity to “commit ourselves and one another and our whole lives unto to Christ our God.” St. Leo truly understands that Christ is the very center of his whole life, indeed the whole world. So much so that any kind of scientific thought that leads us away from the reality of Christ born, crucified and risen does not deserve to be called science. In St. Leo’s understanding of the world, science and reason are gifts from God. As creator, God has endowed us with the ability to observe, understand and work with all of creation. Thus, since every good and perfect gift comes from the Father of Lights (see James 1:17), true reason and science lead us towards God, not away from Him. Christ is the over-arching reality that informs every other aspect of life. To put this another way, the question isn’t science or God and the answer isn’t science and God. Rather it is science because of God. On a day when leaders from around the world gather to discuss the issue of climate change, the issue of the corruption of science is being discussed by skeptics of global warming. The hacked emails of the CRU at East Anglia University have called into question our ability to rely on science for objective truth. For my own part — as someone who loves science, its perspective, its applicability and its possibilities — I think it is about time we all question science’s ability to determine truth. When done correctly, science is not interested in truth — it is interested in testing hypotheses. In fact, the scientific method often finds failure far more valuable than success. We learn more about our world and how it functions through failure. The term “scientific law” — such as Newton’s Law of Gravity — is really a misnomer. A law in science is really just an hypothesis that has failed repeatedly and consistently to be proved wrong. Scientific laws are not set in stone — we just haven’t found the technology or situation where they can be proved wrong. Besides which, science asks the wrong questions when it comes to truth. All the riches of Divine goodness are showered on us…by the visible and bodily appearing of the Truth itself. This, of course, is based on the words of Christ in John 14:6, “I am the Truth.” There is a double meaning to this statement, because “I AM” is the name of God revealed to Moses at the burning bush. Christ is claiming not only to be Truth, but to be God — I AM. The riches of Divine goodness that is showered upon us is made possible through the Nativity — God has become a human being. When married to this reality, science is at its best. Divorced from this reality, science becomes a monster. I have already discussed the consequences of divorcing environmentalism from God, so let’s look at stem cell research for an example. When Truth is understood to be a person, we are forced to look at science and research from the personal perspective. We are not dealing simply with cells, data and results. We are dealing with persons. When faced with the Truth incarnated — the reality that God has not only made us in His image and likeness (Gen 1:26-27), but has also taken on all of our humanity in the person of Jesus Christ — we can no longer glibly sacrifice fetuses in the name of science. Dr. Timothy Patitsas, Professor of Christian Ethics at Holy Cross Greek Orthodox School of Theology, likes to say that life begins at compassion. The Truth has shown us the way to compassion — God sacrificing Himself willingly and out of love so that we might have eternal life in Him. The Truth is that God values each and every one of us so highly that He was willing to go to the Cross in the person of Jesus Christ. The Truth is compassion personified. When we recognize the Truth in others, especially those that our own government refuses to legally recognize as human, not only does our compassion lead us to treat others as we would have them treat us, but it leads us towards the path of Truth — toward a life in Jesus Christ. We start down the path to become the person we are supposed to be. At its best, when coupled with a recognition that Truth is a person, science helps us get onto that path where we find the Truth in ourselves. Amen.